Prime Minister Vladimir Putin has published another article explaining his presidential platform in Rossiiskaya Gazeta. This time, his subject is the modernization of Russia’s military. Russian Prime Minister and presidential candidate Vladimir Putin has published another article explaining the finer points of his presidential platform. The latest text, published in Rossiiskaya Gazeta focuses on his proposed reform of the military and the defense industry. The government has already allocated about $23 trillion to achieving this goal over the next decade. “We shouldn’t postpone the decision to create modern armed forces and strengthen [Russia’s] defense potential,” the article reads. Putin emphasized that both the Russian Army and Navy suffered from underfunding during much of the post-Soviet period. “Meanwhile, other countries have been consistently increasing their military muscles,” Putin wrote. The prime minister’s plan makes no attempt to reduce the size of the military, rather it aims maintain the current number of military personnel, increasing the number of professional militaries over conscripts by 2020. However, experts believe that demographic problems may prevent Putin from achieving these goals. In taking on the issue of conscription, Putin is confronting one of Russia’s most persistent problems. 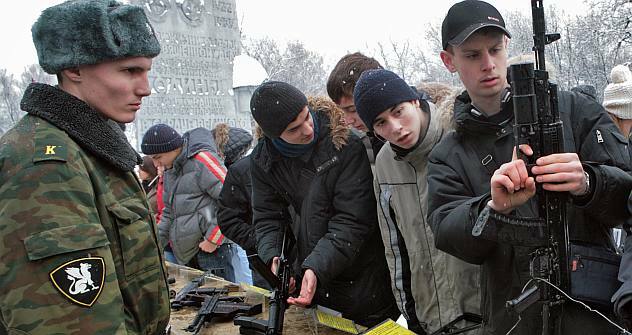 Military service is mandatory for young men in Russia. According to Article 59 of the Russian Constitution and the federal law on military service, every Russian man over the age of 18 is obliged to serve one year in the Russian army. Men are chosen for service through a conscription process. Dodging official service is illegal and can result in criminal charges, but there are several ways to get an exemption. Service can be postponed for men enrolled in university; those who have completed courses in high schools in the Reserve Officers Training Corps are also exempt from conscription. Conscripts can be exempt for health reasons upon providing necessary documentation. Men are subject to conscription until the age of 27. Ilya Bulavinov, a military columnist for Kommersant says that Putin’s text is actually more ambivalent about conscription than it first appears. On one hand, Putin claims that Russia’s major goal is to build a professional army. On the other hand, he takes into account that a “professional army is expensive” and comes up with a compromise to maintain the mixed system of recruiting soldiers, given the current financial capacity of the country. “I believe that Putin lacks enough political will to cancel the conscript-based army as an institution because it would be very difficult to return to it given the fact that 80 percent of conscripts are reluctant to serve,” Bulavinov said. Combimed report based the information from Kommersant Daily and Rossiiskaya Gazeta.